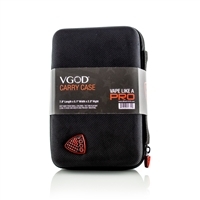 Holds your e-Cigs and 4 10ml bottles of E-Liquid or a number of other items and accessories. Great customer service when handling this product...they reached out to let me know of the delay in shipping... and threw me a present for the wait! I replaced a current case with this one and I couldn't be happier. This case holds up to four eMus Vapes and four bottles of V-Lixir. I don't usually carry the V-Lixir, but I use four different Vapes with different flavors in them. It is great to keep them all together, convenient, and arranged so the different flavors are identifiable by location in the case. This is great.